A rabbi offers a program of soul-craft to get us through the “World of Separation,” this reality where nothing quite works and nothing quite makes sense. “If the soul is so wise then why do we stop listening to our souls?” That is not the only rhetorical question that LA–based rabbi Levy (Hope Will Find You: My Search for the Wisdom to Stop Waiting and Start Living, 2010, etc.) raises here. 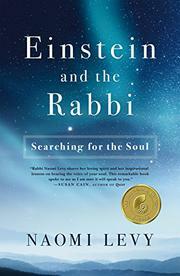 Pondering a letter written by Albert Einstein to a rabbi decades earlier, in which the renowned physicist mused about why we humans behave as if we were somehow disconnected from the whole, Levy proceeds to offer common-sensical suggestions to forge links to our better angels—by, for one thing, praying. To skeptical listeners in a class, she posed it as a challenge: “Why not approach it as an experiment? Try waking up and reciting a morning prayer for two weeks and we’ll discuss it then.” Bingo: logging the hours produces results. “If you long to connect to the divine,” she continues, “begin studying, and you will receive timeless wisdom.” The author occasionally drifts into the soft precincts of the Sedona set, as when she likens the “California Roll”—what elsewhere is called the “New York stop,” drifting through a stop sign without ever quite stopping—as the way most of us rush through religious practice: “There is a tradition to stop and take three steps backwards at the start of the prayer. Why? We imagine our souls leaving this space and entering a holy space. Suddenly we are standing in the very presence of God.” For all the cheerful exhortation, there’s also serious reckoning with the big picture, with matters of life and death and the travails of daily life. Throughout, Levy comes off as a trustworthy guide, with just the right leavening (or perhaps unleavening) of humor and endless compassion. Like-minded readers will find Levy’s blend of Old Testament and New Age appealing.